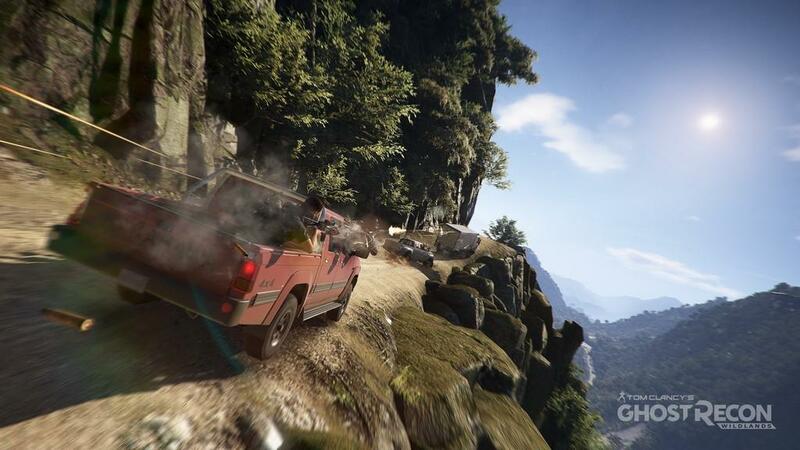 If real life Bolivia is anything like Ubisoft Bolivia then it's a worthy destination for any vacation. Just stay clear of the cartels I guess. 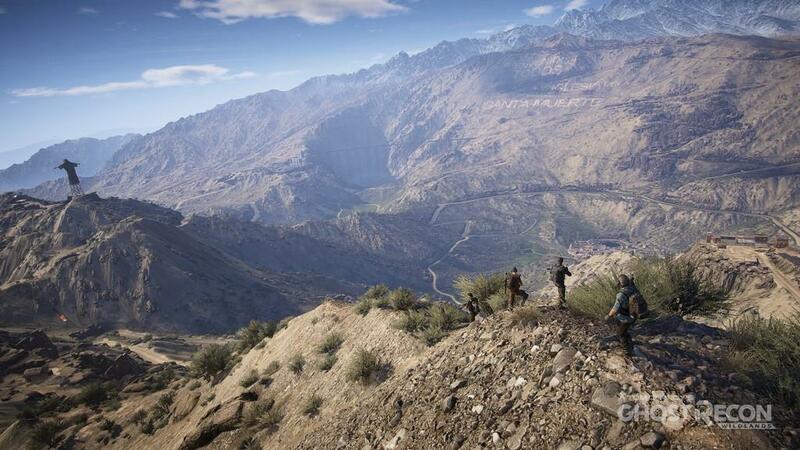 Tom Clancy's Ghost Recon: Wildlands features one of the more beautiful open worlds you will find in any game. While it shies away from the realism of recreating specific sights and monuments that are the hallmark of their most recognized open world adventures like the Assassins Creed series, it delivers a massive arena of mountains, valleys, rivers, villages, and various strongholds in which to stage the game. It is a fantastically beautiful world to explore, and massive, measuring 20 in-game kilometers end to end. Shame then that this wonderful playground is nearly ruined by one of the worst driving experiences I have ever played. There is this deadly combination of wonky driving mechanics and terrain that never seems to offer anything resembling a flat surface or straight line to traverse. It's nearly impossible to maintain any kind of safe speed. Touch the gas and your hurtling past the rest of the traffic, let off and you're no longer moving. The slightest mistake on a narrow, windy mountain dirt track littered with pedestrians (that you're not supposed to kill) is often punished mercilessly with a mad tumble down the side of the cliff. The condensed realism of the landscape creates a trap for any traveller. The roads creep up the side of steep ascents switchbacking to and fro. It's just how you'd imagine a lovely mountain path to run, but it's just not fun to painstakingly toil your way up. It would be one thing if wonky mechanics were balanced by a forgiving world, but the combination just exacerbates the problem. Even relatively flat terrain always seems to include just enough bumps along the road that taking the path at any sort of speed soon has you jumping up and down like a lowrider showing off it's hydraulics. In a bold, massive open world, there is a lot of time between engagements where you have to do that traversing and it nearly always wants to let you down (mostly by hurling you off the side of a cliff). Thankfully, this isn't just a driving game and even more thankfully there is rarely a time when a helicopter isn't far away. The one saving grace of this game is the abundance of helicopters. Apparently, Tom Clancy's world has changed much since he penned Clear and Present Danger. If you remember the film, Harrison Ford, as Jack Ryan, badly needs a helicopter to exfiltrate the black ops team in Columbia, and is extorted into paying $2m for use of a chopper. Well apparently, down south in Bolivia, helo scarcity is not a problem. The cartel boss, El Sueno, seems to have been modeled after Oprah: "You get a helicopter, you get a helicopter, everyone gets a helicopter!" From cartel outposts to military bases to resorts along the lake, everyone is well stocked with air transport. Taking to the skies not only avoids the treachery of the mountain roads, but actually flips the script on the control mechanics. Once you get used to them, helicopters handle beautifully. So what's to do in this wild world, beside fly over it and take in its natural splendor? The game basically boils down to your role in a four man team of Ghosts, sent to destabilize a Mexican cartel that has taken over Bolivia. Form the local military to the media, they control everything. You are tasked to work with the local rebels and collect intel on a series of escalating targets. Intel sites lead to mini-bosses, one per region. Mini-bosses lead to mid bosses across a number of arenas for the cartel: production, distribution, influence, protection. Kill or capture all the mini-bosses and the mid-boss and the way is open to the major boss, the head of each operation. 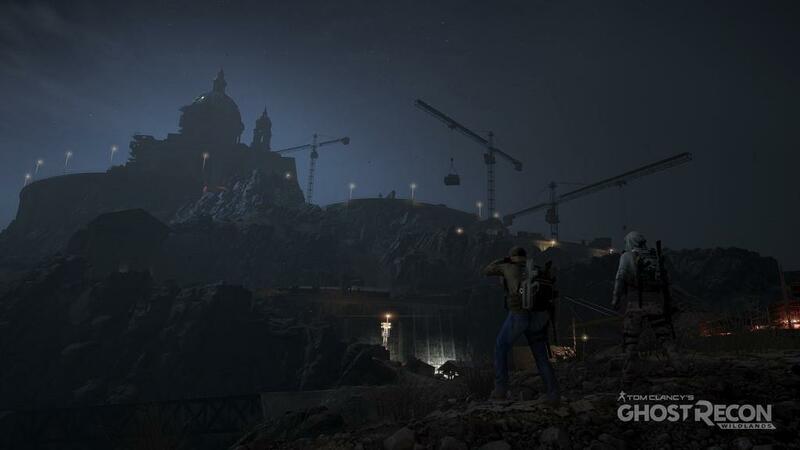 Take all of them down and you've got your chance at the big boss, El Sueno. As you progress new weapons, skills, and upgrades open up. Your three companions and the rebels occasionally come in handy, but there is this very delicate balance there you can feel the developers try to tightrope. Make companions too strong and the game becomes a walking simulator, make them too weak and you break character from a Tom Clancy game to become John Rambo, or more accurately, Rico Rodriquez from Just Cause, only without the big explosions or grappling hook (you do get a parachute though). In the end, your companions are mostly useless, and constantly break the fourth wall pulling you right out of the immersion the gorgeous open world really wants to draw you in to. The big design decisions that lead to this are: 1.) your teammates are invisible to enemies and 2.) they mostly behave like zen buddhists in their pacifism. If you really try to go stealth in this game, and carefully tip toe your way into an enemy encampment unnoticed, be careful not to sprain your neck shaking your darn head as you'll constantly be confronted with sights like teammates standing in clear view crouched at the knees of a bad guy and them taking no notice. When said bad guy sees you he will start shooting and mercilessly gun you down as teammate crackles over the comms "What you want me to do boss? Should I take him down?" It's only when your dead and bleeding out that they become full ninja assassins, capable of clearing any room to leave no man behind and apply first aid. Once on your feet they revert back to mostly useless. There is a command wheel, and it is used to call in reinforcements and supplies from the rebels as well as give team actions that mostly do nothing. Tell the team to attack and they will hang back until you start taking fire. I believe this mechanic was intentional to try and keep some difficulty going and focus the onus on the player for actions and accomplishments. Nobody really wants their AI squad to do everything for them, but at the same time if given an AI squad I'd like to be able to actually give them instructions. It's no fun to just be a bystander as the orchestra plays themselves but let me be the conductor and we can make beautiful music and feel engaged. That's where the sync shot comes in. With upgrades and your own aim you can down up to 4 spotted enemies at once. 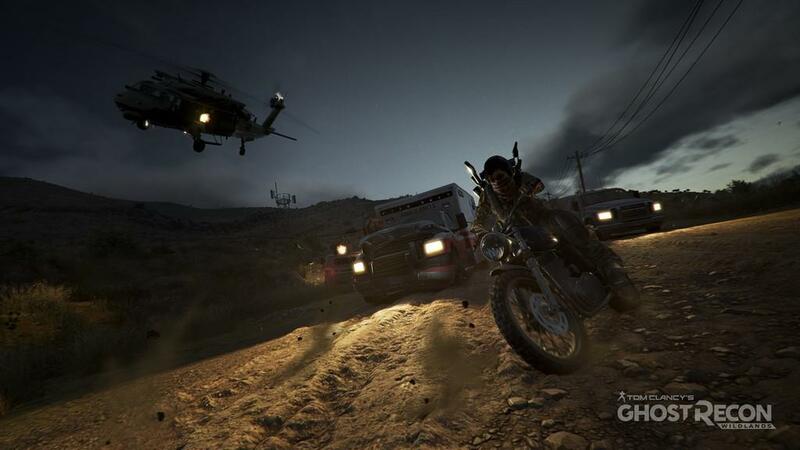 It is there that the tactics of Ghost Recon Wildlands mostly begins and ends. You can do the stealth thing and painstakingly creep through each challenge if you choose. Or you can just lean on your drone like a crutch, generously scan every encounter and spot every enemy in the encampment, snipe a few in the watchtowers, and then sync shot just about all the rest of them into a shallow grave, maybe having to clean up the last few manually with a little close quarters battle. In the end the game is way too easy to figure out, and the repetition of the encounters quickly takes over. The plot is kinda silly. Many in the series of bosses have backstories that are eyeroll worthy but it's a video game, whatever. Even as the repetition set in fairly quickly: collect intel by taking out a few strongholds, go after a mini-boss, move on to the next location; I longed for more from the game but was remained content with what it did offer. I was hoping there would be a few grand set pieces to stick in my memory so I kept playing. Long past when I had what I needed for the review I kept playing, hoping to reveal those set pieces. Maybe the next boss would be some better mission. Maybe the major boss would add some new wrinkle. Sadly, those moments didn't come. I was glad to keep playing. The game is fun. Simple, but fun. Beautiful, and fun. Unfortunately though, the closest you really get to grand missions is when, instead of simply killing a target you have to capture them and add the very slim tactical layer of finding a vehicle to safely drive them away with (usually another helicopter). It has other strengths. The character creator lands right in a sweet spot to give you plenty of options to create your ultimate cliched dirtbag soldier of fortune but not too much that you get lost in the minutia of cheekbone structure. There is a lot to do. 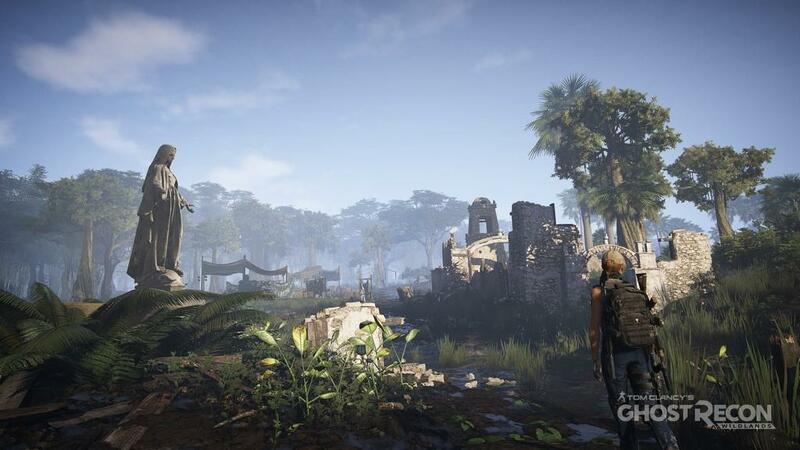 It's a not an amazingly varied palette of activity but there are bits and pieces hidden all over the map and the map is expansive and gorgeous. There is a level of depth in the details: annoying DJs chatter along on the radio and missions within a region tend to string together. There are a few clever moments when the otherwise blank slates that serve as your unit crack a joke in a quiet moment in a vehicle or serve up some other bit of clever dialogue. At the end of the day I was left with an open world game that felt very much like an Ubisoft title in its look and feel but played more like Grand Theft Helo. It's taking the best of Tom Clancy but watering down that critical tactical element and going a little too over the top in the storytelling. What you're left with is a repetitive semi-stealth shooter. It's not particularly challenging unless you want to handicap yourself to make it so. But it has its moments. Overall the gunplay is sufficient, and only occasionally dips into frustrating when, after spending a bit of time to find and secure a nice ride, you fail the very next mission because an AI teammate loses his mark just as you squeeze the trigger on a sync shot, causing your presence to be noticed and failing that specific mission parameter, losing your sweet new ride in the process of automatically reloading the mission. Or that time I finally found an awesome APC with a tank turret and proceeded to slowly plan the beast along to my next mission. It took forever to wind that thing up the mountain only to, within sight of the goal, accidentally flip the whole vehicle onto it's back like a stuck tortoise when I failed to navigate a particularly narrow corner sided by a small ledge. Argh!